Running a marathon was never on my list of things to do. It wasn’t a goal I had always hoped to achieve. I never really aspired to athleticism of any level really. When I started writing my recap of my first marathon experience I kept going back many years before. For those reading this I hope you don’t mind taking this journey with me. It wasn’t until I was running the actual marathon that I began thinking about the road I took to get to that very moment. My memories reminded me of how far I’ve come. The outcome of the race has inspired me to go further than I ever dreamed. 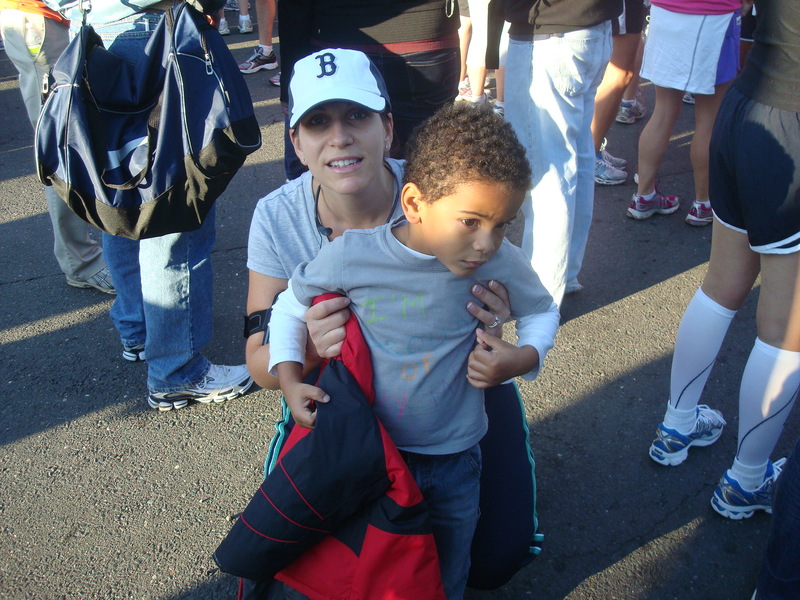 Years ago in college I accompanied a friend to Boston to work at the Boston Marathon. Her aunt and uncle owned a rental company that supplied a variety of equipment to the marathon. They operated out of a trailer at the finish line. I did a number of odd jobs to help set up the marathon. The day of the race I actually had the opportunity to see the winners cross the finish line. They were super human to me. How could anyone run that fast? The sheer magnitude of what they had accomplished made me tear up. Yet it wasn’t the elites that really touched my heart it was all the others. One after another the runners finished. All seemed to have a story in their eyes. The tears, the hugs, the silver blanket, the medal, family members rushing up to greet them and it repeated over and over again, each time just as touching. It never crossed my mind that I too could accomplish a similar feat. I was heavier than I had ever been, out of shape, a smoker, occasional drinker and didn’t eat nary a vegetable. I said things like, “Those people are crazy. I would never run a marathon, hell I probably couldn’t even run to the end of the street.” That was in April 1998. Fast forward to December 2006. My life changed forever when my son was born. I instantly felt a surge of love that I have never felt for anyone before. The thought of possibly not being around to see my son grow up frightened me. I had quit smoking 9 years earlier thanks to an infection in my pinky finger. That is another story for another time. Postpartum I was just a few pounds less than I had weighed in 1998 and the scale tipped at just over 200. I had no medical issues but I knew that at the rate I was going I would someday. It took me a year to lose the “baby” weight and by Carlos’ first birthday I was down to about 180 pounds. I worked out sporadically, mostly walking. Carlos began walking at 10 months and 2 weeks to the day. His walk quickly turned into a run. I knew that it was just a matter of time before I would be lagging behind huffing and puffing to catch my breath. I had to do something. Something had to change. I thought about running as a form of exercise because working full time at night and taking care of Carlos during the day I wasn’t able to find the time to go to the gym. I figured running would be the easiest thing to do, tie my sneakers and go. I tried and hated it. HATED it! My sister finally gave me some advice that helped. She told me to run the long sides of a track and walk the short sides. With a little nudging I tried it and slowly conquered the track at the local college. There was a third of a mile loop around the real track for anyone interested in running or walking. I did the run/walk method three times around to equal a mile. Sometimes I did two miles. I wish I had documented my progress, but at some point I started running the entire loop, then two, then three. Below the track was a pond with a one mile trail around it. Once I could run three loops around the track I took my run down below. It was much more scenic and made the run seem less tedious. Running was starting to feel good. My friend and I signed up for a 5K race in Binghamton, NY where she was living at the time. It was in the fall of 2008. I steadily built up my mileage to 3 miles. I’m certain I even got to 4 at some point in the training. I wasn’t fast but I was ready and really excited. Then circumstances beyond my control made it impossible for me to run. Instead I was there as a spectator. My friend did an incredible job for her first 5K. I was so happy for her, but really jealous. I wanted to cross that finish line too. I had worked so hard. Instead of feeling drive and motivation from watching my friend and others run the race I quit! I stopped running for a while. It wasn’t until the following year when I decided to give it another try. By this time I had discovered the healthy living blog world. So many women just like me were running and racing. The recaps were so inspiring to read. They were all shapes, sizes, ages and backgrounds. I signed up for another 5K in my area for the fall of 2009. At the last minute my sister offered to run it with me. The morning of the race we woke up to rain and cold. I made my husband and son stay home because I didn’t want them out in the bad weather. My goal was simply to finish, but I knew I was capable of a 12 minute mile. My sister pushed me and encouraged me the entire way. Imagine my surprise when we approached the finish line and the time clock read 31:09. I felt so victorious and in the blink of an eye I caught the race bug. We were nearing winter and the racing season was all but finished, but I decided that I would keep running at least once a week. I actually ran during light snowfalls on a few occasions and loved it. I didn’t run far and still wasn’t running very fast, but I kept it up through spring typically running 2-3 times a week. By spring I was back to running outdoors. My breathing was easier to control, my legs felt more comfortable and seemed to yearn for more at the end of a 3 mile run. I knew I wanted to race again. 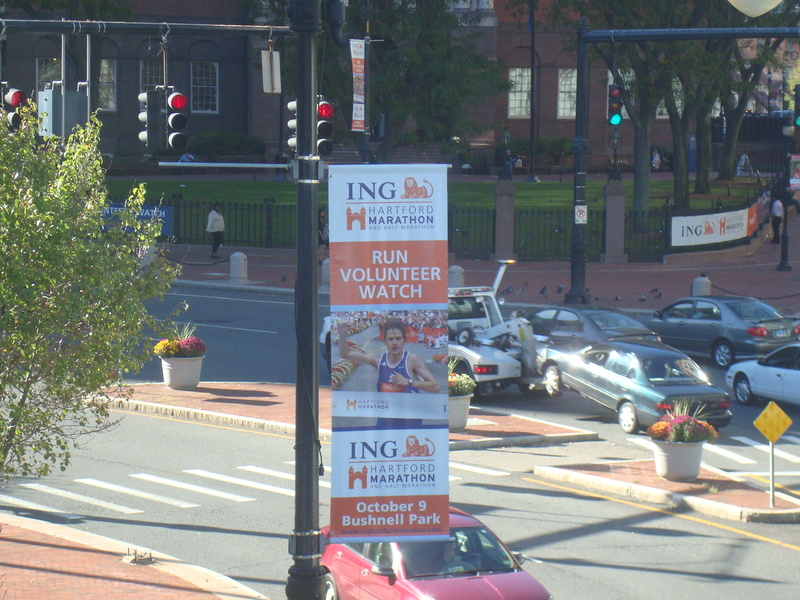 I saw something about a half marathon in Hartford, CT in early October 2010. I had plenty of time to prepare. I signed up, read up on training plans, picked one, made a schedule and the rest is history. Prior to my first half I ran a total of two 5Ks and a 10K. Once on the half marathon course I knew I had trained well. I felt fantastic. I never once thought of giving up. I had my usual goals in mind the first being to finish and the second was to come in under 2:30. I wasn’t wearing a Garmin or using anything to track my time during the race. I simply ran to the best of my ability. I was floored when I pulled into the finish line at 2:21:49. I exceed even my own expectations. I wasn’t even finished running the half marathon when I knew I would run a full marathon. It wasn’t because I felt ready to run 26.2 miles. It was because I knew with proper training I could do it and at that point I really wanted to know what it would feel like to run a marathon. 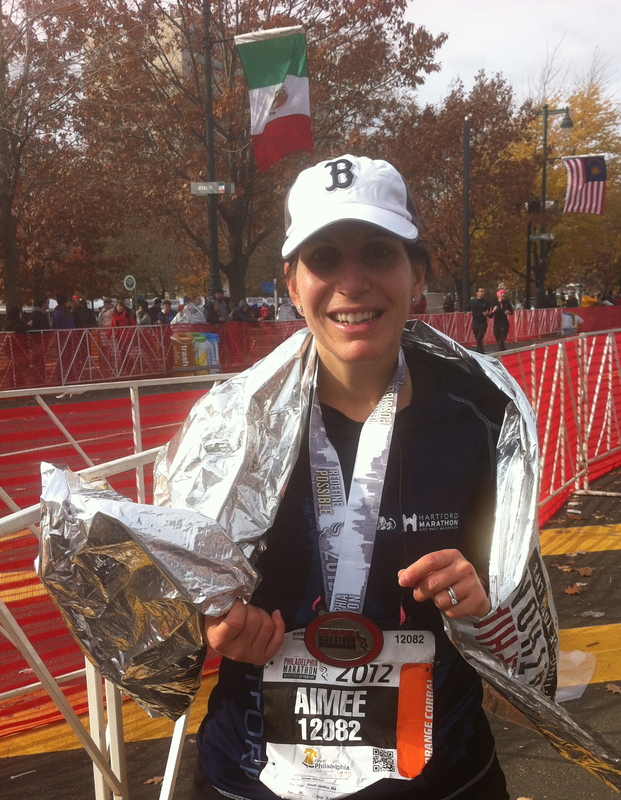 Aimee…thank you for sharing your background to getting to the marathon…I personally find it fascinating…and not only that…just think…you are one of those people with an amazing story now…CONGRATULATIONS!!! Loved reading this post Aimee! Still so proud of you!! Hi Aimee! I really like this post because–it really is all about where we have come from that brings the perspective. You explain that part very well. It was all very interesting to read and discover. What a great story! And your son is a cutie! Love reading about the road that lead you to your first marathon. Very cool story, thanks for sharing. I don’t know how I possibly missed this post Aimee, but I loved it. It’s a great story, and I’m so proud of you!! Love this post, Aimee! It’s cool to read what has inspired you along your running journey! Funny, after running my first half marathon, I thought NO FRIGGIN WAY can I run a marathon! LOL! I was awfully happy to see that finish at 13.1!